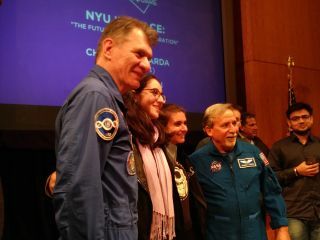 NASA astronaut Charles Camarda (fourth from left) and ESA astronaut Paolo Nespoli (first on left) posing for photographs with students at the NYU Tandon School of Engineering after a panel presentation on Thursday, April 19, 2018. NEW YORK — Some astronauts think poets and cinematographers deserve a trip to space. Astronauts Charlie Camarda and Paolo Nespoli were mission specialists on different Space Shuttle Discovery flights. In 2005, Camarda was part of STS-114, the first shuttle mission to fly after the tragic Columbia accident that caused the deaths of seven astronauts. In 2007, Nespoli crewed the STS-120 Discovery flight, and returned to space two more times for Expeditions 26/27 and 52/53 on the International Space Station. "When I was a little kid, people would ask me, 'Paolo! What do you want to be when you grow up?' and I would say, 'I want to go to the moon!'" Nespoli said during the April 19 event. He made a grumbling sound to imitate the naysayers who thought his dreams were cute, but confined solely to the realm of his imagination. Nespoli said he kept doubting himself until he was much older. "I had to get to 26 [years of age] to say, well, you know what happens if you have a dream and you don't try? You already fail." Camarda touched on his youthful dreams to fly, too, and talked about the special significance of the first and only voyage he made into Earth's orbit. "We flew right after the Columbia incident, and so we had all this new technology that we had to test out to make sure we would fly safe." Both astronauts agreed that shuttle flights encouraged a "sprint" mentality and gave a sense of hyperfocus to their work, since the flights lasted just a few weeks. But Nespoli said long-duration space station expeditions, lasting several months at a time, were more like a "marathon" and therefore gave him more time to reflect. Nespoli also painted a romanticized image of artists coming on board the space station. "I am in space and I am looking at the beautiful Earth at night. When I’m supposed to sleep, I go and I look out the window and I look down and I see Earth and I can think, can you imagine what would happen if there was a poet here? A photographer? Incredible pictures!" said Nespoli. "I'm just a guy that tries shooting a picture and goes away, but there isn't someone who’s there [taking photos] 24/7. We need cinematographers. We need theologists." But not all moments were full of wonder. Nespoli revealed that his mother's failing health during a mission brought on a "sense of impotence." Speaking about the difficult experience, Nespoli added, "you’re still a human being that works from 7:30 in the morning to 8:30 in the evening … but we cannot compartmentalize those things." The question about humanity's next big steps in space also arose. Both astronauts said humanity will extend itself beyond the blue planet, and Camarda emphasized the importance of robotics and machinery over human transportation vehicles, at least for now. "If we really want to go to the moon, and to Mars … I think it's going to be the machine and robots that will be blazing the trail," Camarda said. "We'll be pre-positioning the technology … so that when we do send humans to these far reaches of the universe, we make sure that they are as safe as possible." Astronauts Paolo Nespoli (seated left) and Charles Camarda (seated right) prepare for a panel discussion at their alma mater. Prior to being acquired by NYU, the engineering school went by other names. When Nespoli attended the school in the late 1980s, it was called the Polytechnic University in New York. When Charles Camarda attended in the 1970s, it was called the Polytechnic Institute of Brooklyn. In addition to hosting the microgravity experiments that could make deep-space human exploration possible, the space station is also a tribute to what's possible when nationalism is cast aside for a common human goal, the astronauts said. "Over 15 different countries helped to build pieces of a vehicle that's the size of a football field flying in space, that was never assembled or fitted on Earth," Camarda said. "And we did it together." Follow Doris Elin Salazar on Twitter @salazar_elin. Follow us @Spacedotcom, Facebook and Google+. Original article on Space.com.